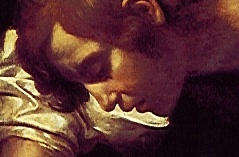 Caravaggio's Boy Bitten by a Lizard is an odd image that has been interpreted by scholars in numerous different ways. Several of them agree, however, that the boy is a self-portrait. Michael Fried's interpretation, the most recent, seems to me the most persuasive in part, of course, because it fits our paradigm. 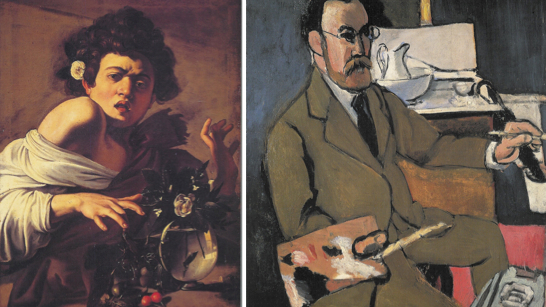 Fried argues that the boy, turning to look out over his shoulder, represents how the artist himself would have sat at his easel while turning to see his face in the mirror. 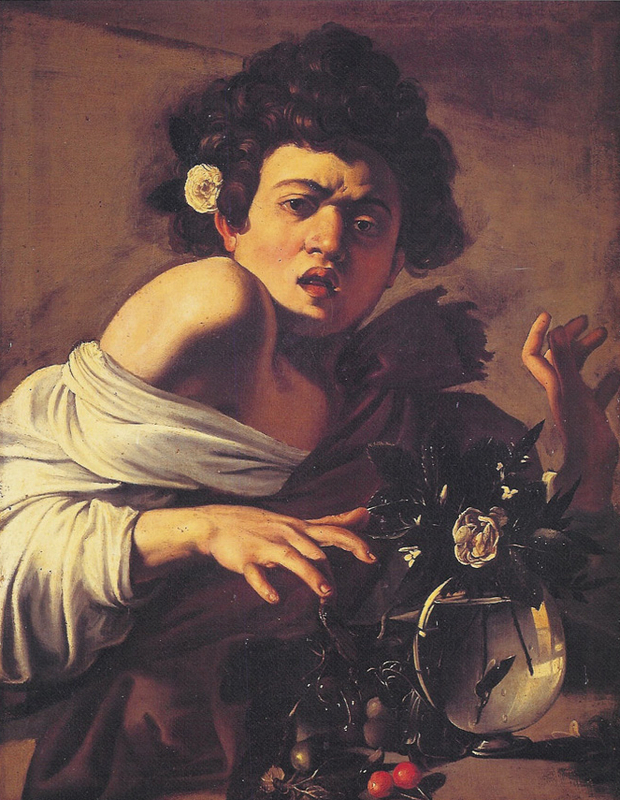 He compares it to a self-portrait by Matisse to demonstrate how the boy's far arm moving towards the right edge of the frame must represent Caravaggio's own brush-arm reaching towards the canvas. The boy's torso would be facing the easel, which would have been placed at a right-angle to the mirror. The near hand, palm horizontal, must be the palette-arm. 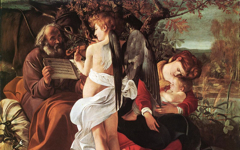 He believes that this method of painting - from a mirror placed perpendicular to the easel - began in the first decade of the sixteenth century. 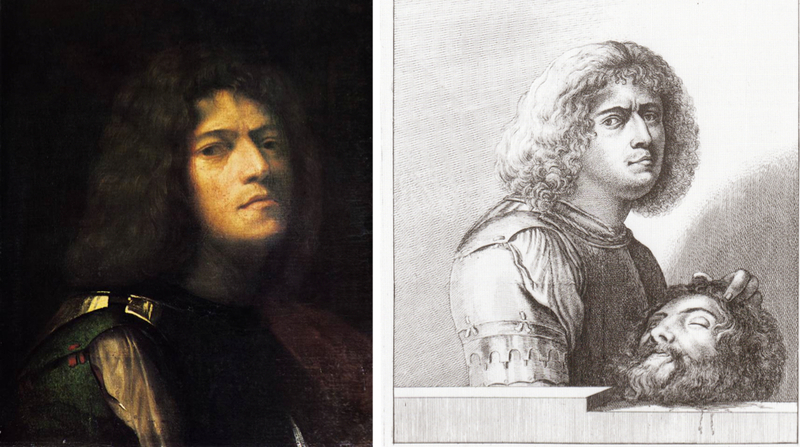 That is why, he argues, the heads in so many self-portraits turn away from the torso.1 (The image at far left is thought to be a surviving fragment of the actual painting reproduced in the engraving.) I have argued for years that the over-the-shoulder pose was characteristic of self-representation in that artists often turn to look at their model while keeping their torso facing the canvas. That, at times, they were turning to look in a mirror is Fried's original contribution. My argument is this: artists or an alter ego are posed this way, looking out over their shoulder, in order to suggest to future artists, art's most important audience, that they are looking in a mirror. Painters would recognize this because, theoretically, they would be used to posing the same way themselves. As such, this painting and hundreds of others like it confound a basic principle of art history: the viewpoint of the spectator. There is no space for an observer here unless we imagine ourselves, as the artist himself did, as the figure portrayed. In doing so, we learn a fundamental truth: we are locked in a box, the Platonic cave. The human mind can only see what it already knows. We paint our own reality which is why the phrase, every painter paints himself, is so profound. The world, as we see it, is a reflection of our own minds as the double meaning in the word reflection suggests.4 Only a creative thinker's imagination can break out of the box and see what is really happening from the outside, a meta-view of the mind. Michael Fried believes that self-referential paintings like Boy Bitten by a Lizard are largely confined to a group of artists that he has studied in depth: Manet, Courbet, Caravaggio and their followers. The truth is, as this site clearly demonstrates, large numbers of artists over many centuries have practiced the same tradition.3 Besides art is, and always will be self-referential. It is a basic principle of the practice. However the wider meaning of Boy Bitten is not our purpose here. 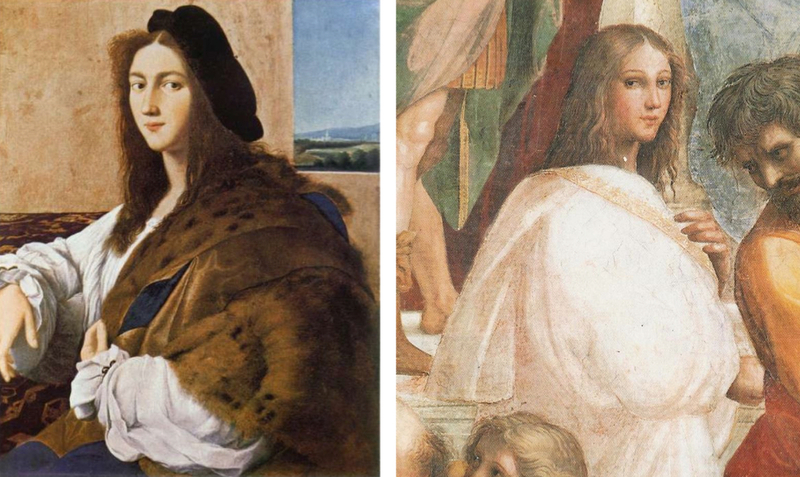 It is simply to show that the over-the-shoulder pose is an important, little known sign in art that the surface of the painting is a "mirror" and the figure a self-representation of the artist. Thus, contrary to conventional opinion, there is no space for the viewer unless you can imagine yourself in a privileged position behind the artist's eyes. As literature and music do too, art guides the individual soul towards a gnosis, a profound understanding of the human mind and the wider cosmos inexplicable logically. Paintings by artists (as distinct from nature's copyists) are not "photographs" or records of reality but mental reflections. So don't forget this. Whenever you see a figure looking over their shoulder and appearing to look out of the painting they are, more likely than not, a representation of the artist in the act of painting in a mirror. This, in turn, makes the entire composition a reflection of their own mind. 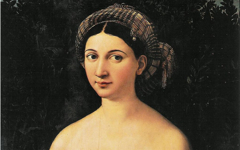 Beware of biographical stories trying to explain a great portrait; they are rarely, if ever, true. 2. The pose even strengthens the possibility that the painting at far left of a figure wrapped in a fur is a self-portrait, a point some scholars had doubted. The fur even suggests the hair on a painter's brush. 3. I will discuss Fried's overall thesis at a later date. What he identifies as common characteristics of paintings, such as absorption and theatricality, are accurate but not as an end in themselves, as he believes, but common features of how artists portray the process of the work's creation in their own minds. Figures absorbed in their own thoughts represent the work's gestation in their mind while theatricality usually represents the actual performance of the artist at work and, thus, the physical creation of the painting. It all takes place in a dream world, though, the artist's mind and not in exterior reality regardless of how realistically portrayed. Original Publication Date on EPPH: 25 Feb 2011. © Simon Abrahams. Articles on this site are the copyright of Simon Abrahams. To use copyrighted material in print or other media for purposes beyond 'fair use', you must obtain permission from the copyright owner. Websites may link to this page without permission (please do) but may not reproduce the material on their own site without crediting Simon Abrahams and EPPH.